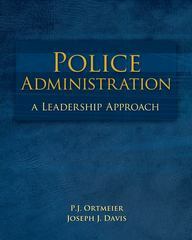 Police Administration: A Leadership Approach 1 Edition Police Administration: A Leadership Approach was written to support the need for a text that addresses supervision and management as well as ethics, leadership, and the principles of policing that form the foundation for efficient, effective, and lawful administration of the modern police service. Unlike other texts, this book blends theory with practice. It presents a foundation for the administration and management of a police agency in a logical, flexible, and understandable step-by step process.